This dragonfly is extremely popular! The colors of the wings are inspired by the water of a crystal-clear lake, making the pearl wings feel translucent next to the dark body. The long flowing antenna and the shape of this dragonfly provide a classic feel to this very familiar form. The basic frame of the dragonfly is created using tin, which is powder coated with a black finish. The frame is reinforced using tin wire along the inner edge. Capiz is an oyster shell and the primary purpose of the oyster is as a source of food. However, the by-product, the shell, can be used for decoration. Due to it being a natural material, the natural colors of the capiz come through as tans and browns underneath the paint. The shell is then painted the bold colors you see. The entire front facing piece is carefully hand-painted keeping in mind the reflective qualities in the color of dragonflies. A gecko lamp started it all. While vacationing in the Philippines in 2003, the founder of Eangee Home spotted the charming piece. A talk with the creator sparked an idea, and upon returning home he and his partners opened a small retail store to sell the lamp and similar items. A few years later they realized that if they shifted their focus to becoming a distributor they could bring a wider variety of unique, sustainably made products to the market. They decided to focus their partnerships with makers in the Philippines since the concept of creating by hand and being detail oriented is part of their cultural tradition. The unique designs they offer are a result of a collaboration of their experience from years in retail, and the creative minds of the artisans with whom they work. They are committed to ensuring that all of their products are eco-friendly and are made of renewable and/or recycled materials with food- based dyes and low-impact finishes.While the business has grown, they've stayed true to their core mission of filling people's homes with sustainable products while supporting the talented makers who create them. To help ensure this, all makers they partner with have access to clean, safe working spaces, living wages, healthcare, continuing education, and quality housing. Eangee Home is a founding member of the Sustainable Furnishings Council; a coalition of manufacturers, retailers, and designers dedicated to raising awareness and expanding the adoption of environmentally sustainable practices across the home furnishings industry. This dragonfly is very cute, and is very similar to dragonflies I have purchased at a competitor, for the size and quality - Great Value! Beautiful color of this tin dragonfly. 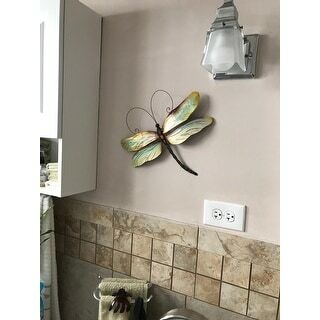 I have my bathroom decorated with dragonflies I been through several different colors in the bathroom already and her colors blend into every color I use ! Nice size not giant sized , or super small worked well just where I hung the dragonfly! 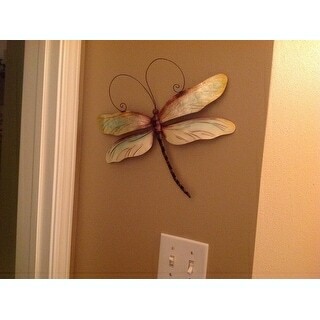 I love this dragon fly, it looks classy and it matches my living room great. 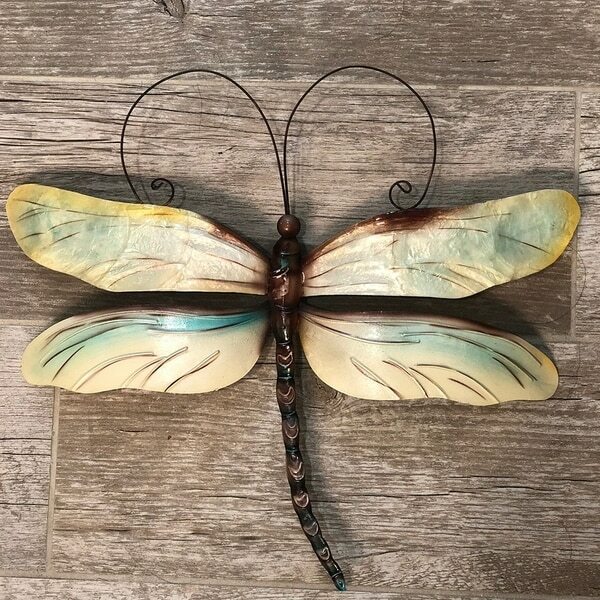 I have been wanting to order this dragon fly for some time and it recently came back in stock. Made of good quality and looks fantastic in my living room, only complaint is that it is a little more yellow than green as pictured in the picture. Overall well worth the money! 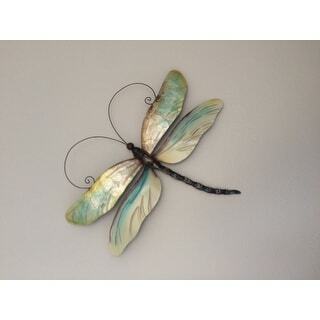 I bought a couple designs of butterflies as well as this dragonfly and have them clustered on my wall. They are all beautifully painted and the colors are vibrant. 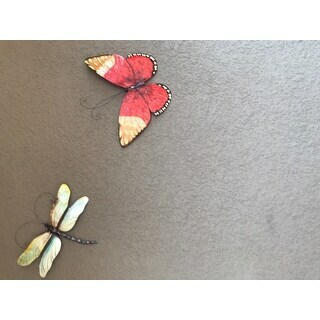 If you love a bit of the outdoors in your home, you will love these butterflies as well as the dragonfly. Even though I was expecting this to be a bit stouter, I just love it. It's so pretty and adds a unique look above a large frog that I have sitting in my entry way on a table. The fly is in conjunction with a round mirror with the wide metal framing of about 18" of metal design in the same color as the body of the fly. Along with a metal framed bird on a branch also in same colored metal. This with misc. plant action included really looks cute. Was glad to give it a place of honor to show it off. I thought the picture of the dragonfly was pretty, but it doesn't do justice to the actual piece. When I opened the box, I was thrilled with the color and quality! It really is gorgeous! The size is perfect for any wall, not to large, not to small. I wasn't sure if it would be a "bulky" piece, but the metal is thin and beautifully crafted. Kudos to the artist! I almost did not buy this item because a few reviews said he lower wings were hand painted. I think the dragonfly is beautiful! It is about the size of a 8x10 picture frame. A little expensive for its size, but worth it. Sweet but not exactly perfect. The colors were good but this looked a little cheap and tinny. Nevertheless, I bought a couple for a blank wall. They serve the purpose. Its beautiful and I love it.. You have to get one it's beautiful and you will love it..Trust me.. So very pretty! Substantial size. I recommend it! This piece was made with colors that fit my decor perfectly. You will like the way it looks with flowers or with other birds or bees prints. Good value and well made. I bought this for a friends birthday. It is very pretty and good quality, I can’t wait to give it to her. Love my little dragonfly. I was going to use it on my patio, but it was a bit small for the area. Instead, I hung it in my kitchen nook. It is a perfect reminder of spring. This was a great purchase. It was very well made and the colors are stunning. I would definitely recommend it. I like everything about this piece. I'm an avid admirer of dragonflies. This piece fit exactly where I wanted it to go and looks amazing when the sun hits it just right. I love this dragonfly so much I will be buying another. It’s quite sturdy, and just beautiful in person. It coordinates so well with the other pieces I purchased for my bath, but it could be hung outside on the patio as well. The color is perfect. 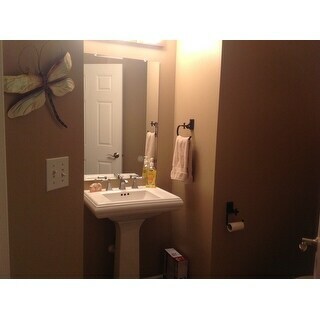 I was really impressed with the quality. A very pretty decorative item that could be used almost anywhere. Very nice colors. Just wish it would have been a little smaller in size. This is gorgeous! Thanks so much! This is approximately 12"H x 13"W x 1"D.
I saw this right away and loved it. I have a duvet cover with birds, butterflies and dragonflies on it and it is a very busy duvet cover. I have been looking for something simple to put on the wall and this was just the thing I was looking for. "can this be hung outdoors?" Hello izzyluck, this is recommended for indoor use. Thanks for shopping with us!